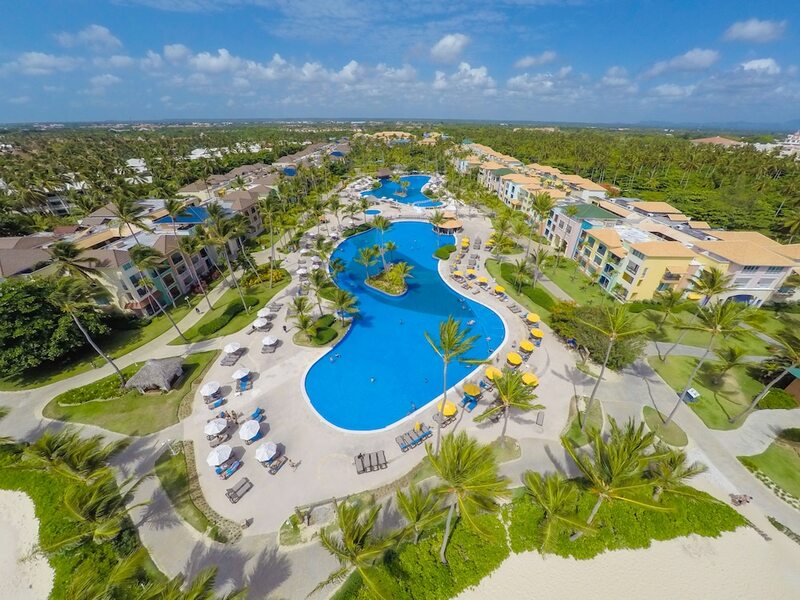 When you stay at Ocean Blue & Sand Beach Resort - All Inclusive in Punta Cana, you'll be next to a golf course, within a 10-minute drive of Hard Rock Golf Club at Cana Bay and Iberostar Golf Course. This 4-star property is 3.2 mi (5.1 km) from Arena Gorda Beach and 7.4 mi (11.9 km) from Bavaro Beach. Make yourself at home in one of the 708 air-conditioned rooms featuring private spa tubs and LCD televisions. Rooms have private balconies. Complimentary wireless Internet access keeps you connected, and cable programming is available for your entertainment. Private bathrooms with shower/tub combinations feature jetted bathtubs and complimentary toiletries. Relax at the full-service spa, where you can enjoy massages, body treatments, and facials. After a day at the private beach, you can enjoy other recreational amenities including a casino and a nightclub. Additional features at this property include complimentary wireless Internet access, concierge services, and babysitting/childcare (surcharge). Grab a bite at Blue Moon, one of the property's 7 restaurants, or stay in and take advantage of the room service (during limited hours). Snacks are also available at the coffee shop/café. Mingle with other guests at the complimentary reception, held daily. Visit one of the 9 bars/lounges, 20 beach bars, and 2 poolside bars for a refreshing drink. A complimentary buffet breakfast is served daily from 9 AM to noon. Ocean Blue & Sand Beach Resort - All Inclusive is an all-inclusive property. Room rates include meals and beverages at onsite restaurants and bars. Other items and amenities, including taxes and gratuities, and access to recreational activities and entertainment may also be included. Additional charges may apply for meals at some restaurants, special dinners and dishes, certain beverages, and other amenities. Simply walk outside to smell the salt air and watch the ocean waves from the white sand beach. Pamper yourself with a treatment at the full-service spa and enjoy amenities at Ocean Blue & Sand Beach Resort - All Inclusive like a complimentary children's club and an outdoor pool. Guests can enjoy a complimentary breakfast each morning as well as a complimentary manager's reception. Dining is available at one of the property's 7 restaurants and guests can grab coffee at the coffee shop/café. The property also has a snack bar/deli. Guests can unwind with a drink at one of the property's bars, which include 20 beach bars, 2 poolside bars, and 9 bars/lounges. Wireless Internet access is complimentary. This all-inclusive property also offers a children's pool, an outdoor tennis court, and a steam room. Complimentary self parking is available on site. A complimentary buffet breakfast is served each morning between 9 AM and noon. A complimentary manager's reception is offered each day. El Carey - This restaurant serves breakfast, lunch, dinner, and light fare. Guests can enjoy drinks at the bar. Open daily. Margarita - This theme restaurant specializes in Mexican cuisine and serves dinner only. Guests can enjoy drinks at the bar. Blue Moon - This fine-dining restaurant specializes in international cuisine and serves dinner only. Guests can enjoy drinks at the bar. I Mascheratti Di Venezia - This theme restaurant specializes in Italian cuisine and serves dinner only. Guests can enjoy drinks at the bar. Route 66 - This restaurant specializes in American cuisine and serves dinner only. Guests can enjoy drinks at the bar. A private beach, an outdoor tennis court, and complimentary bicycles are featured at the property. An outdoor pool and a children's pool are on site. Other recreational amenities include a sauna and a fitness center. Despacio Spa Centre has 2 treatment rooms including rooms for couples and outdoor treatment areas. Massages are available on the beach and in the spa; other services include hot stone massages, facials, and body wraps. A variety of treatment therapies are provided, including aromatherapy, hydrotherapy, and reflexology. The spa is equipped with a sauna, a spa tub, and a steam room. Please note that from now through April 30, 2019, all guests under 23 years of age must be accompanied in the same room by an adult who is at least 30 years of age or older. Minimum Spring Break check-in age is 25 years old. Reservations are required for golf tee times, massage services, and spa treatments. Reservations can be made by contacting the property prior to arrival, using the contact information on the booking confirmation. A resort fee is included in the total price displayed. Only registered guests are allowed in the guestrooms. This property participates in Biosphere, a program that measures the property's impact on one or more of the following: environment, community, cultural-heritage, the local economy. Book a minimum 3-night stay in a rate plan displaying the “Limited Time Offer: USD 250 Resort Credit per room, per stay” green tag now-December 23, 2019 for travel now-January 31, 2020 and receive a USD 250 resort credit (per room, per stay) for use on the following: USD 40 spa credit, USD 40 for romantic dinner at select restaurant, USD 40 for wine at select restaurant, USD 80 for room upgrade (subject to availability), and USD 50 at the photo shop. Full details provided at check-in. Spa appointment may be required. Guest must provide voucher at time of service. Spa treatments coupons apply to massages, body wraps, and body scrubs (one coupon per treatment transaction). Room upgrade coupon must apply for full length of stay. Photo shop coupons can be used in conjunction with USD 100 minimum purchase. Resort coupons cannot be applied for beauty salon services, spa product purchases, humid spa areas, facials, telephone charges, and internet service. Taxes and gratuity may not be included. No refunds for any unused portion of offer. Offer subject to availability. Offer is not valid with groups/conventions and may not be combined with other promotional offers. Other restrictions and blackout dates may apply.